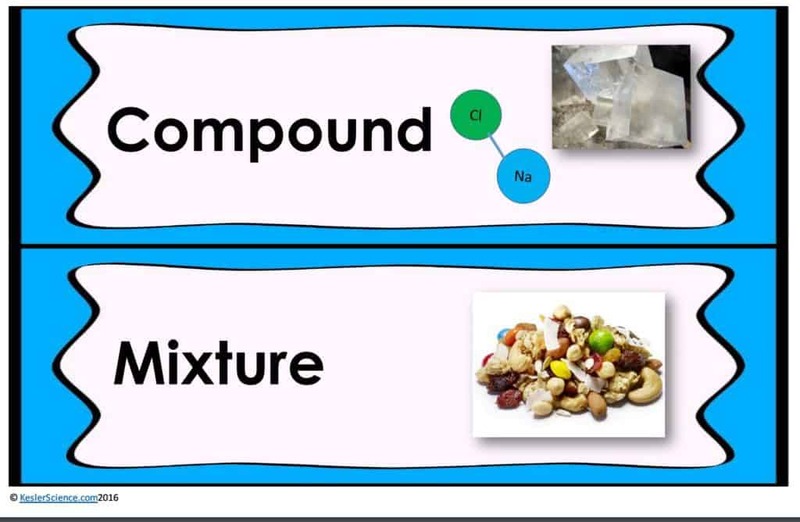 At the end of this elements and compounds lesson plan, students will be able to differentiate between elements, compounds, and mixtures. Each lesson is designed using the 5E method of instruction to ensure maximum comprehension by the students. 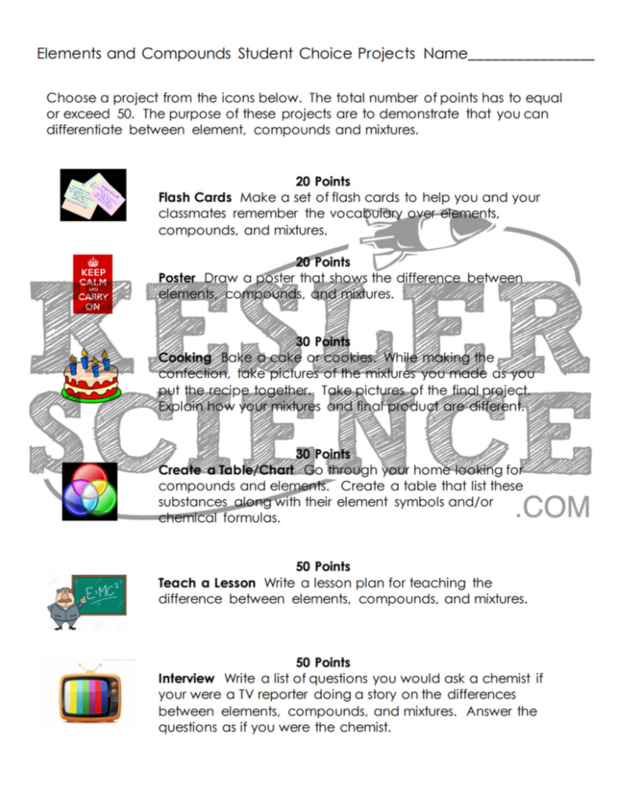 The following post will walk you through each of the steps and activities from the elements and compounds lesson plan. Give each pair of students a bag containing either the mixture or the compound. Ask them to separate the substance on the table. Ask the students to explain how they separated their substance. Talk about why some groups could not separate their substances. Explain that over the next few days they will be learning how to differentiate between elements, compounds, and mixtures. The teacher will help to clear any misconceptions about elements and compounds. A couple major misconceptions are students may incorrectly assume that only elements (not compounds) are pure substances. Also, students may incorrectly believe that pure substances are transparent, free from additives, and safe to ingest. This student-centered station lab is set up so students can begin to explore elements, compounds, and mixtures. 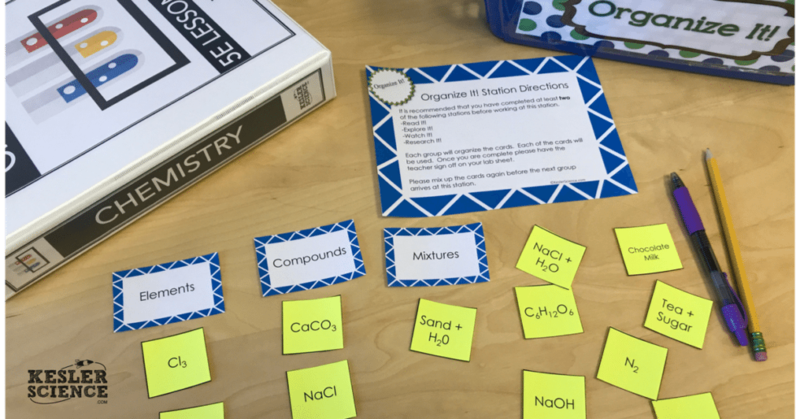 Four of the stations are considered input stations where students are learning new information about elements, compounds, and mixtures, and four of the stations are output stations where students will be demonstrating their mastery of the input stations. Each of the stations is differentiated to challenge students using a different learning style. You can read more about how I set up the station labs here. Students will be working in pairs to learn how to tell the differences between elements, mixtures, and compounds. The best part about this, it involves LEGOS!!!! 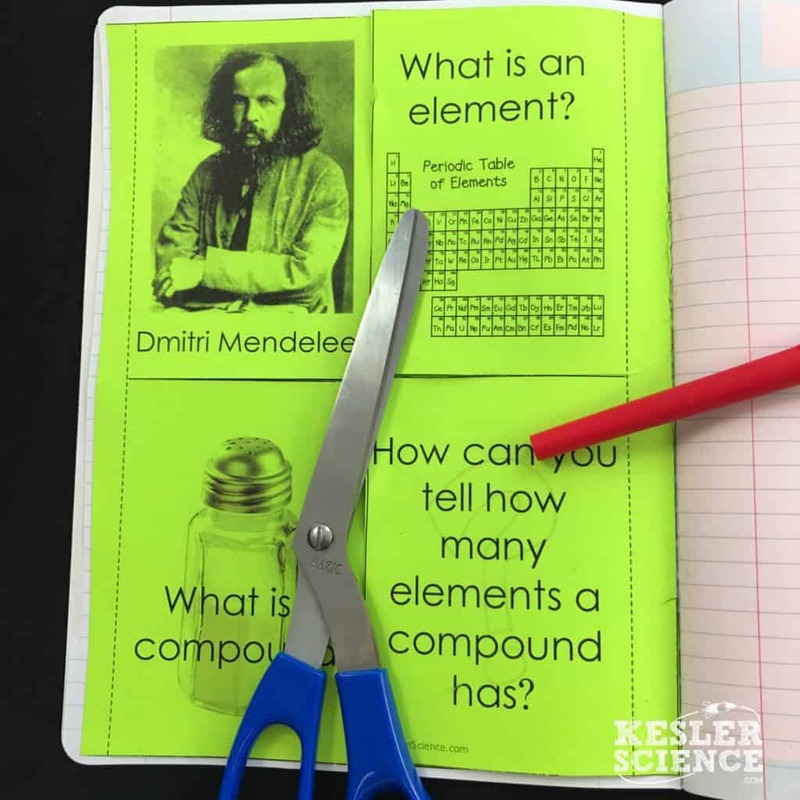 Task cards direct students to take a closer look at how elements, compounds, and mixtures are different from one another. The cards ask students to make observations and write their findings on their lab sheet. At this station, students will be watching a three-minute video explaining the differences between elements, compounds, and mixtures. Students will then answer questions related to the video and record their answers on their lab station sheet. 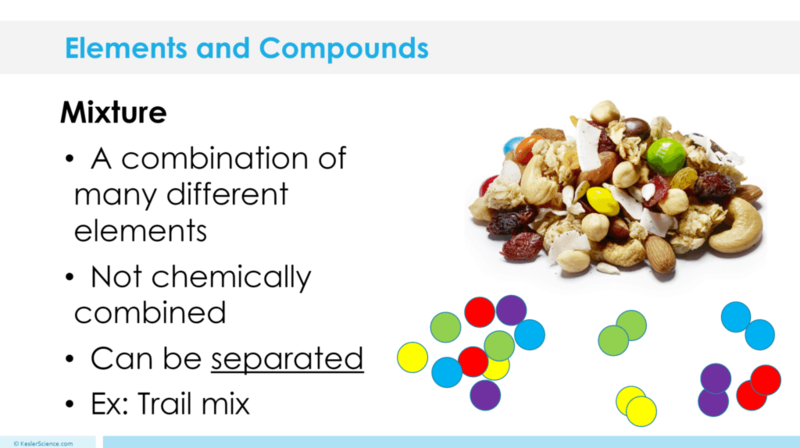 For example, how is a mixture different from a compound? How are the atoms in a compound held together? 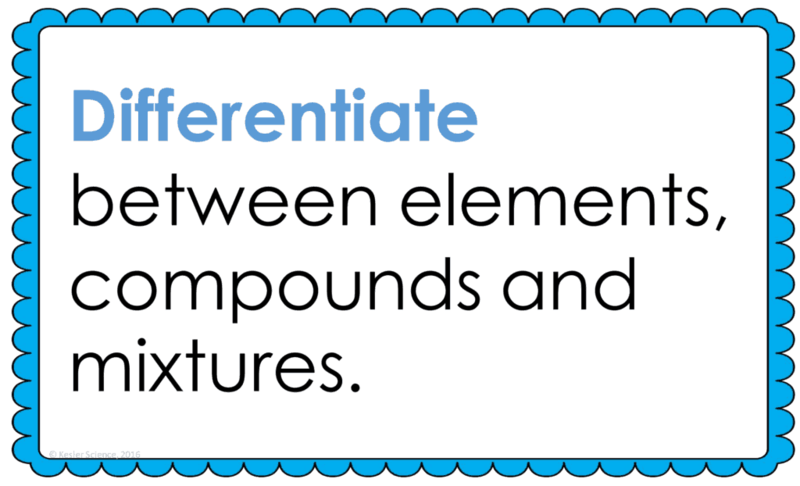 Classify three examples as either elements, compounds, and mixtures. The research station will allow students to interact learning the differences between compounds and mixtures. Students will interact with a presentation explaining how compounds are different from mixtures. Students will also conduct interactive labs showing how to separate mixtures. At the end of the presentation, students will answer 6 questions to check for understanding. This station will provide students with a one page reading about steel production. 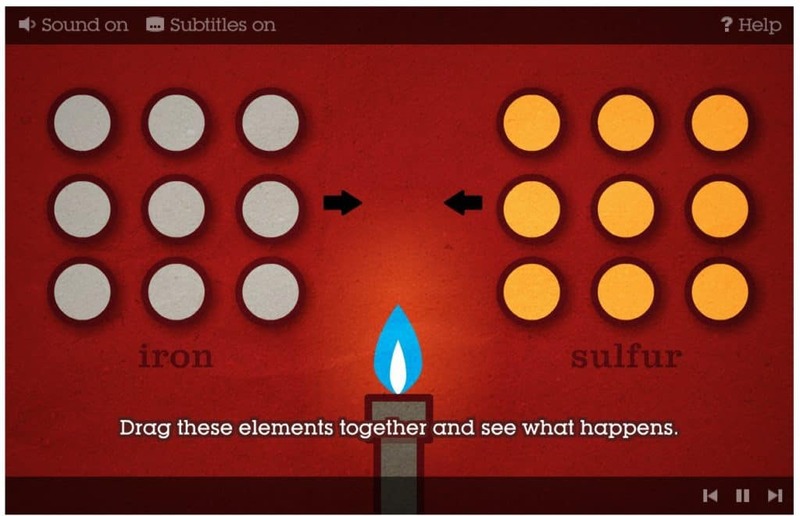 In the reading, students will discover how steel is created by combining certain elements. Students will also find out which three countries are the largest at steel production. There are 4 follow-up questions that the students will answer to show reading comprehension of the subject. The assess it station is where students will go to prove mastery over the concepts they learned in the lab. The questions are set up in a standardized format with multiple choice answers. Some questions include: Which of the following would not be a compound? What does the model represent? How many elements are in the mixture pictured? An element is a what kind of a substance? Students who can answer open-ended questions about the lab truly understand the concepts that are being taught. 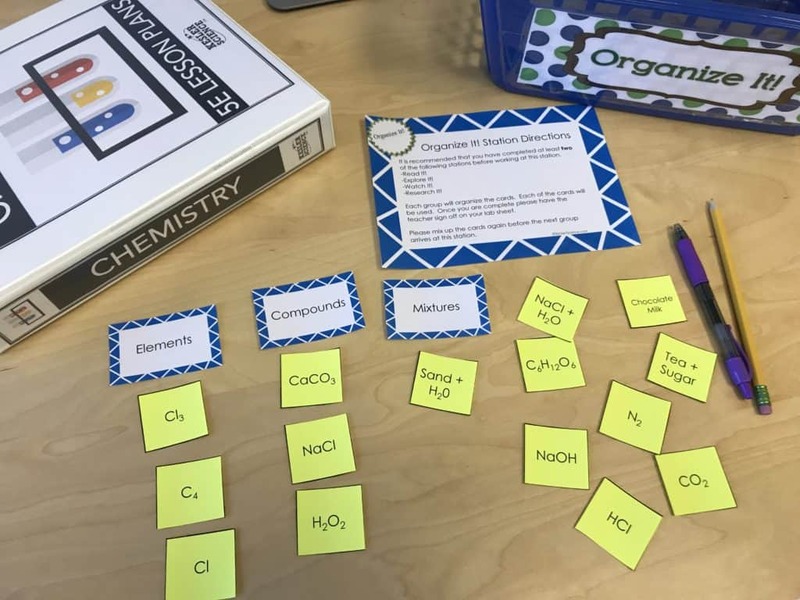 At this station, the students will be answering three task cards: Explain what a compound is and how you can tell one by looking at a chemical formula. How many different elements are present in C6H12O6? How do you know? Describe what an element is. Your visual students will love this station. 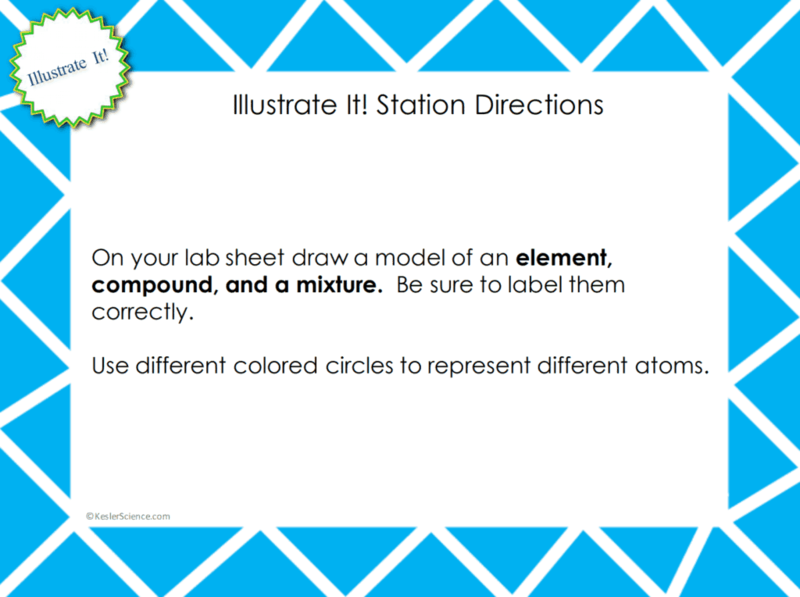 Students will draw models of an element, compound, and mixture. Students will also be asked to be sure to correctly label their models. The organize it station allows your students to place cards under columns that represent elements, compounds, or mixtures. Students will have 16 cards to place under the correct heading. Each card challenges the students to use prior knowledge to identify whether it qualifies as an element, compound, or mixture. The explanation activities will become much more engaging for the class once they have completed the exploration station lab. During the explanation piece, the teacher will be clearing up any misconceptions with an interactive PowerPoint, anchor charts, and interactive notebook activities. The elements, compounds, and mixtures lesson includes a PowerPoint with activities scattered throughout to keep the students engaged. The students will also be interacting with their journals using INB templates for elements, compounds, and mixtures. Each INB activity is designed to help students compartmentalize information for a greater understanding of the concept. 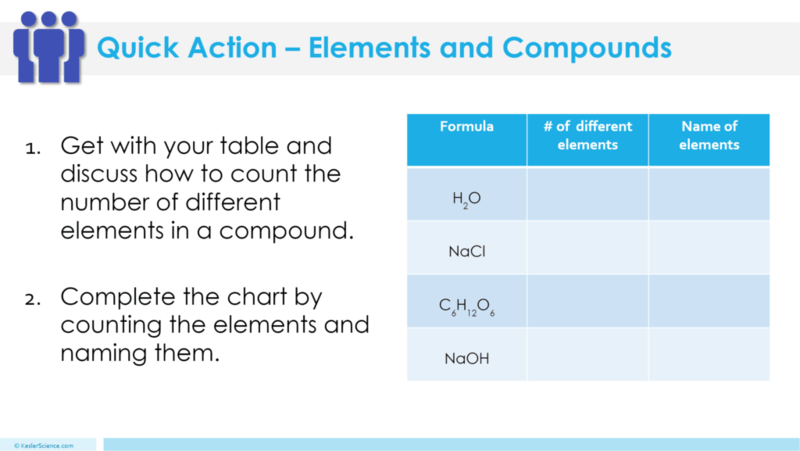 The elements, compounds, and mixtures INB templates allow students to focus their notes on learning identifying the amount of elements in the four spheres, notes on elements and compounds, and identifying elements from compounds.